It’s also important to be comfortable with your current skill level and know that you are going to improve. Now we’ll go over your actual Art Toolbox. Your art toolbox can be as simple as a sketchbook and a ballpoint pen if that's what you prefer to work with. Why is it important to have this with you as often as possible? Like King’s Uncle said, “you never know when you’ll need to use it”. Ideas can strike at any moment. All ideas seem great at the moment, and we tell ourselves we will remember them, but hours go by and our brains are filled with new thoughts and demands. Before you know it, that great idea is long gone. That’s why a sketchbook, notepad or even a stylus for your phone is an essential tool for capturing those fleeting ideas. Once you start sketching or taking note of your ideas you may find a lot of them are terrible when you revisit them. That being said, the more ideas you have the more chances you have of coming up with something that, with some editing, could turn into a good idea. In addition to having something to capture ideas, you never know when you might find yourself with an extra 10 minutes or even an hour to work on a personal project. If you don’t have your sketchbook, tablet, or whatever you prefer to make art with those moments could be wasted time. At the least, you could briefly scroll Instagram or Pinterest and add to your visual library, be observant and study your surroundings, or have an interesting conversation with a stranger that could become a character in a story you’re writing. At the least, I will carry a stylus to draw on my phone. I also jot down project ideas in the Evernote app and Google Docs. Other times I will carry my sketchbook, Etchr Art Satchel and pencil case. If I don’t plan on leaving my bag in the car by itself, I bring my Microsoft Surface Book too. I use it for creating digital art, cleaning up inked pencil sketches and I have a huge library of reference photos and art that’s slowly growing every day. 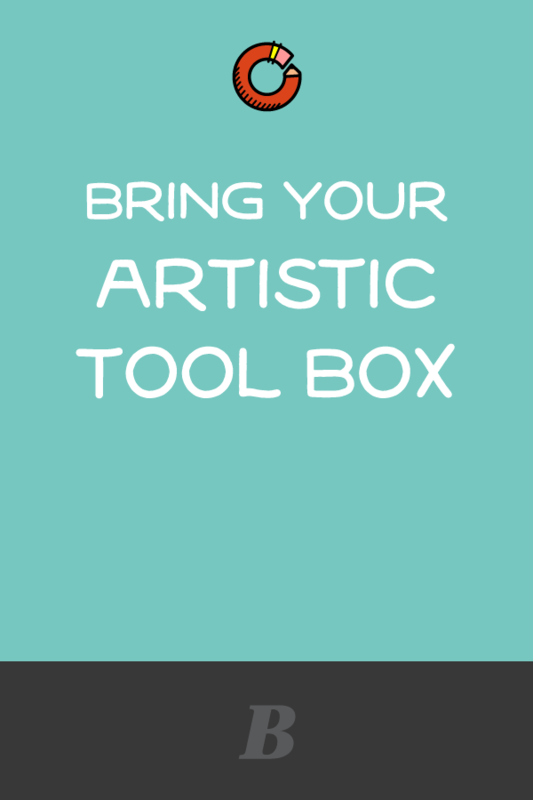 What do you carry in your Artistic Toolbox and about what projects you’re working on?